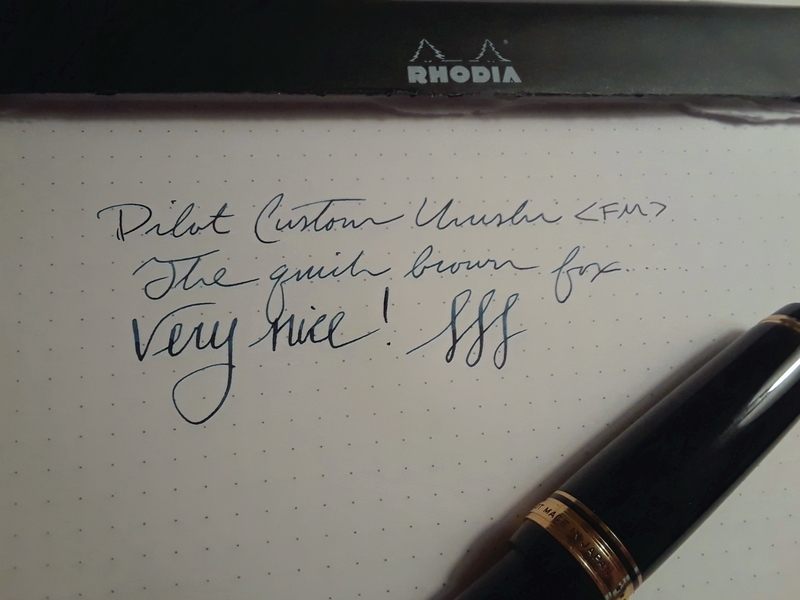 The Big One (of Pilot's Custom line, at least) arrived today. In my photos I'll be comparing it to the Custom 823 (fine) just so you can see how big this pen really is. Who knew the 823 could look so small! It's a nice looking pen, albeit a bit boring. I like the more modern looking flat ends compared to the cigar of the 823. Lines and letters are very clean and the deep black of the urushi looks nice contrasted to the gold. 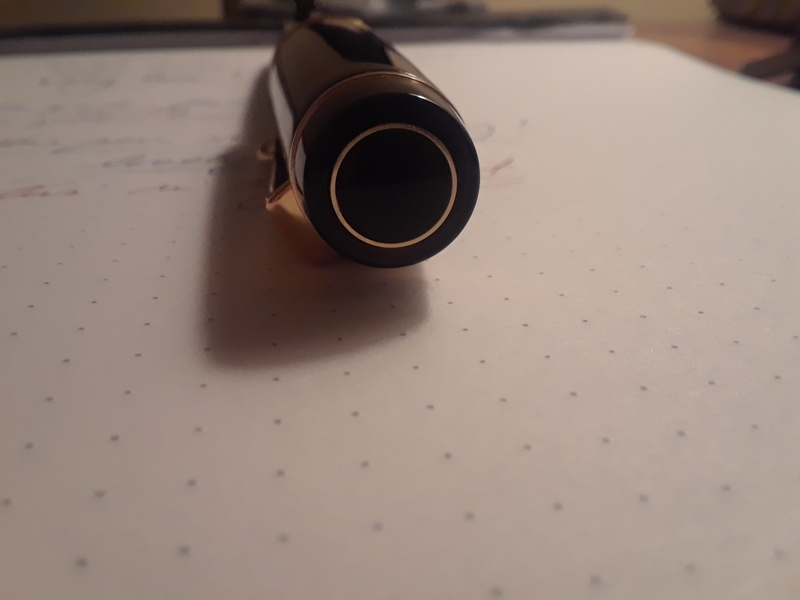 Visually it's impossible to tell that this is different than a plastic pen, feeling it it has the slick smoothness of urushi, but again, would be hard to notice a difference for the average pen user unless you have previous experience with urushi. I really like the ring on the top of the cap finial. Nib of course is beautiful. Overall it's a classy looking pen, and again, while boring compared to other pens at this price range (Italian pens, tamenuri urushi and Maki-e pens, etc.) 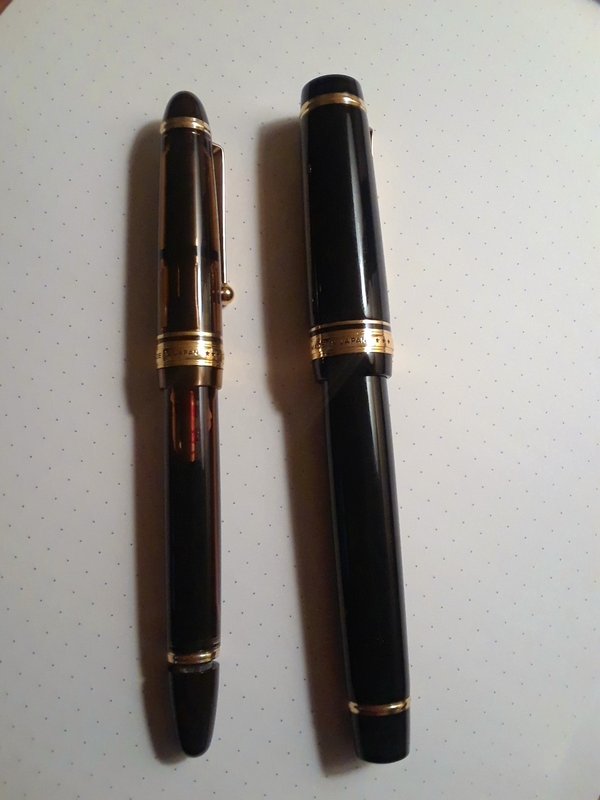 it in my opinion is a little more interesting than the typical cigar black/gold pens like the MB149 and Sailor 1911's. The cap does look a little overly bulbous compared to the body of the pen. It of course is identical looking to the 845 so nothing too revolutionary here. Annoying that the section is plastic (just like with the ebonite KOP). 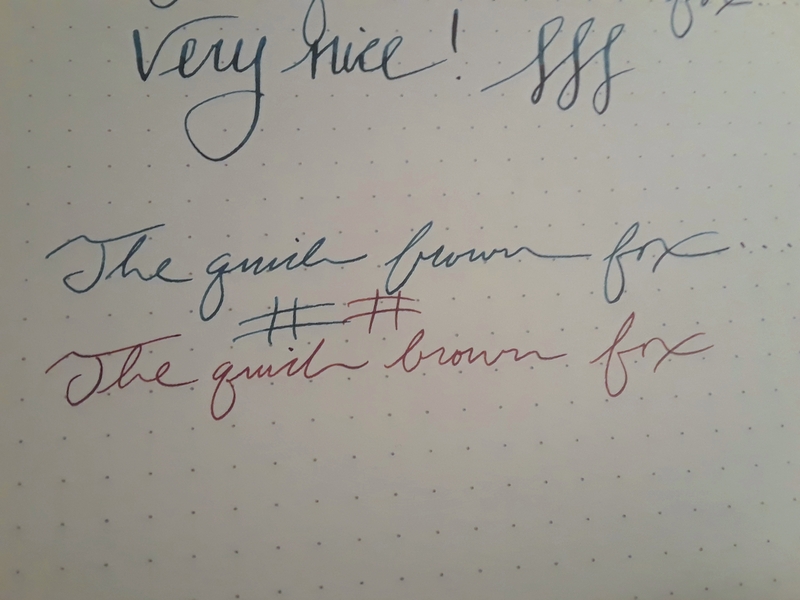 Like all Pilot pens I've used, QC is absolutely on point and puts Italy and Germany to shame (for the most part). Yes, a pen CAN arrive with the tines aligned and the flow set to a perfect wet but not-too-wet level (more on that below with the nib). Feels very well made and high quality in the hand, and looks it too. In the hand, though, it does still just feel like a plastic pen, and feels very different from a 100% ebonite/urushi pen like a Nakaya or Danitrio. Not sure if it's because of the plastic section, or because of the thickness of the ebonite they used for this barrel, but there it is. This is obviously a huge pen. Only buy this pen if you want a huge pen. I wanted a huge pen. I like my huge pen. I have big hands with long fingers so it's hard to find a pen that fits me well. I REALLY like the girth of this pen and I finally have a section I can actually use (as opposed to holding the pen at the threads). It's very comfortable and very well balanced (right at the center of the pen). It is actually very LIGHT when not posted (don't think anyone will post this pen), which is actually a little bit of a detractor for me. It feels like it could use a little more heft for its size, but because it is a C/C pen with a big empty barrel it lacks the heft provided by other filling systems and larger quantities of inks. It also feels like it might be a little -too- girthy, but that may just be my adjustment period coming from being used to cramming my fingers around thinner pens. I wanted a girthier 823 and in many ways I got it, minus the filling system. This is the reason to buy this pen. The #30 nib is magnificent. It is soft and springy with some vintage-like response instead of 'mush' found in other soft nibs. Yes on the surface it looks like any old Pilot nib, but trust me, it feels -very- different. In addition to the wonderful soft springy deliciousness of it, out of the box it was tuned to perfection. Almost every Pilot nib I've owned needed tuning for increased wetness, and many needed a few figure 8's on micromesh to reduce feedback, but this one writes nice and wet right out of box. Not Visconti or Pelikan wet, but that sweet spot of juicy but still dry enough to show off shading and lighter tones. Makes me very happy because that sweet spot is often hard to obtain. It still has some feedback to the nib (it isn't buttery or glassy like a Pelikan nib), but it's pleasant and doesn't 'drag' like some dry Pilot nibs have for me. I may still end up doing a few strokes on the micromesh, but honestly I'd still be very happy without ever bothering. I really like the line width of the FM nib, as you can see (hopefully) below it's definitely broader than the fine nib on my 823, which as it is is on the broader side because I increased the flow of my 823 to be around a 8/10, but not so broad that I can't use it for daily writing at work. It fills with the Con-70, which could be worse. At least the Con-70 has a decent ink capacity. Would have preferred ED or Piston. Years later and I still struggle with filling the Con-70. I don't know how you people get a full converter with this thing. I'm going to end up using a syringe from now on because wrestling with this thing is frustrating and ends up with inky fingers. The plus side is that with this giant nib it's hard to submerge it all the way in many ink bottles, so being able to remove the converter to fill it comes in handy. I would not pay full U.S. price for this pen (over $1000). I won this on eBay for under $700. $600-700 feels about the right price for this pen. 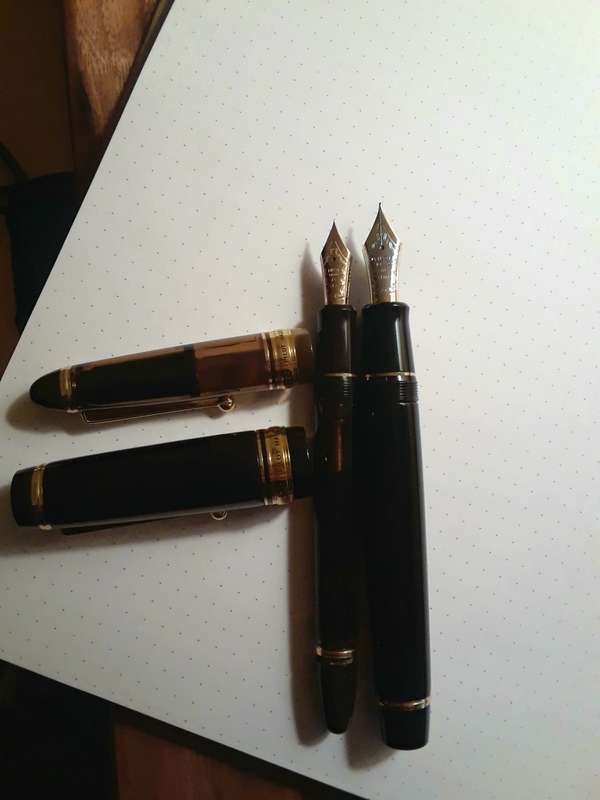 Even though the nib is awesome, for $1000+ you can get a lot more in a pen, in my opinion. Tamenuri urushi, Arco, etc. etc. But for $700 it's a nice pen. The size and the nib make it worth it to me. But probably won't be worth it for many folks, especially when you have so many other options at this price range. If Pilot came out with a tamenuri urushi eyedropper with this nib on it, you're darn right I'd pay over $1000 for it. So I really think this pen will appeal to either someone who has plenty of pens and money to spend, OR someone who is looking for something very specific - an incredible nib with Japanese line width on a big hunky pen that has a nice-feeling material that feels a step up from plastic. The latter was me. - boring appearance, C/C filler, high price. Edited by Betweenthelines, 16 April 2019 - 02:19. I love big pens too, it is not big, its a monster. I tried one in a pen shop, i think it is too weird to bring the beast out, in normal situation.... lol. But surely it is a good pen. And from the sample you wrote, I can feel the writing is comfortable and joyous. I have to say, the more I write with this nib the more I enjoy it and feel like this was a good purchase. It is heavenly beyond words, and I have written with many heavenly nibs. It is definitely Pilot's answer and equal to the KOP nib. I held one of these a few months back but it wasn't inked. 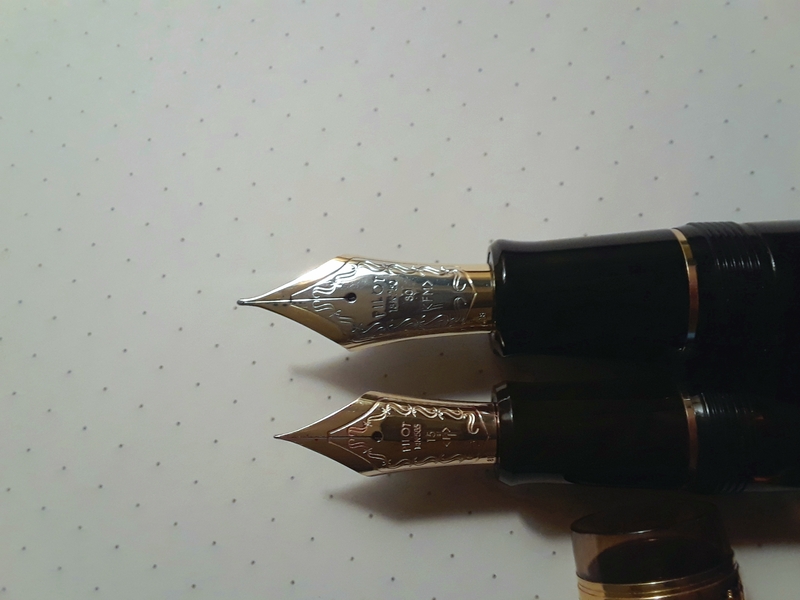 Even though the nib design is simply I really like it, especially compared to the Namiki Emperor which is similarly large. If it is an ED, thatd be no difficulty on bottoming up many inks in the market. LOL.